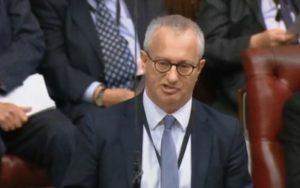 Kisharon School is ‘a jewel in the crown of the community’ and its free school status is driving up educational standards, Lord Polak (Conservative) said at a House of Lords debate this week on the contribution made by free schools in improving educational standards. The new Kisharon School building with advanced facilities for children with learning disabilities and autism is set to open in Hendon in 2020. Speaking in the debate, Lord Polak said: “The most recent recipient of free school status in the Jewish community has been Kisharon, a wonderful special school, often described as a jewel in the crown of the community. “Kisharon is now building a state-of-the-art campus, increasing its capacity from 40 students to 70. The new arrangement between the department (for education) and Kisharon has driven up educational standards and improved the facilities for (those with) learning disabilities. The debate brought together key figures in education including the parliamentary under-secretary for schools Lord Agnew, and the Liberal Democrat education spokesperson Lord Storey. Others taking part included a former trustee of the National Literacy Trust and the chair of York University’s Institute of Effective Education Strategy Board.